SignWriting is the written form of SignLanguage. We want to teach the children the difference between the two languages they live with, Flemish Signlanguage(FSL) and Dutch (written or spoken). If we want to teach the children FSL we would want to write it down, it would be a mistake to write it in Dutch but with the grammar of FSL. SignWriting is also very visual, for ex: if you want to actually show the children the difference between two sign. They can mark it on the board! Not being able to have something on paper about FSL. The children forgot what I told them about FSL because they had no means of remembering, like writing it down. The children didn’t really think FSL was a full language because they where always given Dutch, in books and on paper. I hope it will make the children realise FSL is as good as Dutch, it has the same components and difficulties. It is a FULL language, that is unique and beautiful. 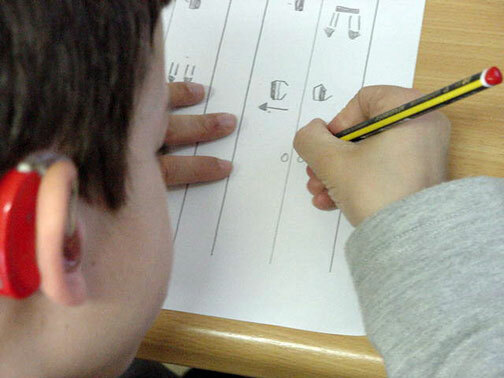 I hope to use the site together with the children to show that they or not the only deaf children who use SignWriting. I would like to send in some of there assignments because I saw on the site that there is no information on the Belgium hyper-link for SignWriting. Seeing it is being used in Belgium, Flanders, I would like to see it on the internet, to inform other teachers in Belgium. I have used SignWriting for one year last year with my younger pupils. I work in a bi-lingual school in Brussels, the children use Flemish SignLanguage and learn Dutch as a second language. We used to just sign away without teaching the grammar of FSL. When I first started lessons in FSL grammar I wanted to write something down and didn’t know how. A friend of mine told me about SignWriting and I started using it. I found it to be of great value. The children love it and learn it very easy. Sara and I are the two teachers who work with SignWriting in the classroom, some of the other teachers use it to but never in full sentences, only single signs/words. Sara is a deaf teacher in our school who is an assistant at the moment but is planning to get a degree in teaching for primary school. I (Kathleen) am a hearing teacher who uses FSL fluently and is active in the Flemish Deaf community. 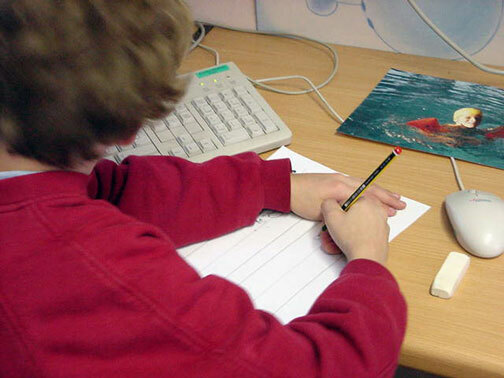 write by hand in vertical columns on special paper designed by their teachers.